Whatever your competitive level and aspirations, a structured training plan for your horse is a crucial tool that allows you to advance in the dressage arena. 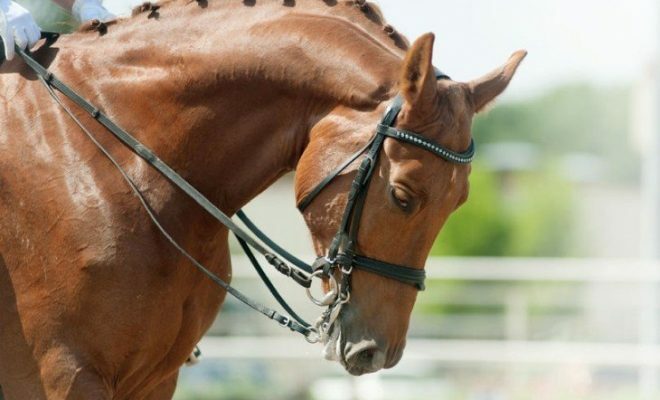 In this article, we look at how you can create a dressage training plan for your horse. One of the most common setbacks experienced by dressage riders is that their horses become stale and bored because of over-training. Sometimes, an over-schooled horse will become resistant or disobedient, possibly because he is physically sore or simply because he is fed up with the same old routine. 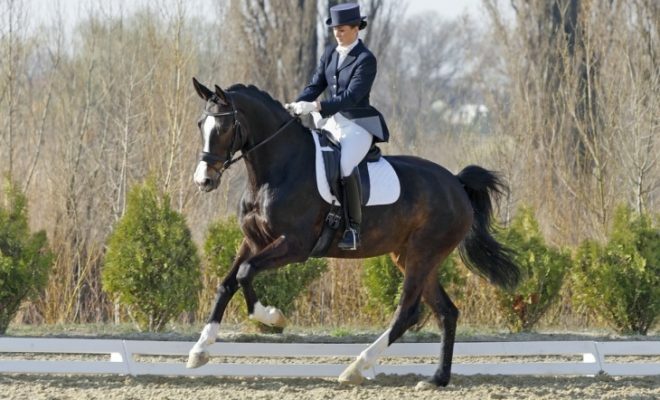 In general, most horses will do well with three or four days of dressage training per week. Also, you should include other activities such as hacking, jumping, and lunging. And your horse will appreciate a rest day turned out in the field! Every schooling session should include a warm-up, a training phase, and a cool-down phase. So, your daily training plan should always begin with a warm-up. The idea of the warm-up phase is to allow your horse to stretch his muscles and loosen his body in preparation for the training section of his workout. Begin with an energetic walk on a long rein and some basic work, including large circles, transitions in and out of the working paces, and some center lines. All your trot work should be done rising so that the horse can use his back freely. 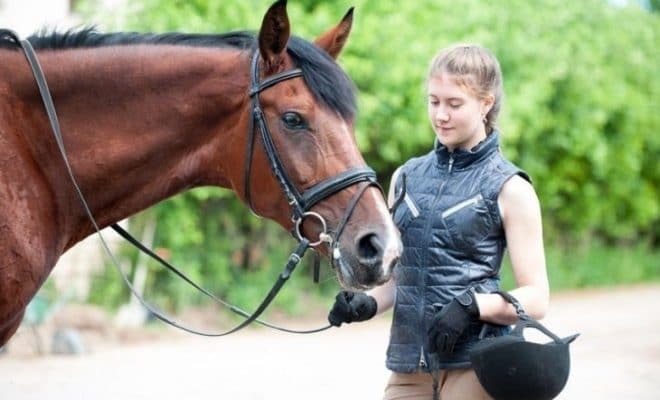 Gradually, the warm-up will include your horse’s confirmed level of work, enabling you to find out what he finds easy and what he sees as a greater challenge, both physically and attitudinally. So, the greater your horse’s repertoire, the more time it will take to warm him up. The warm-up is a good way of evaluating and identifying where your horse is at in his training and allows you to determine the focus of the training phase of your schooling plan. Also, the warm-up allows you to know how long it takes for your horse to be “in the zone” and ready to perform a test. So, when you go to a competition, you will know exactly how long your working-in period should be. Once your horse is warm and mentally focused on the aids, you can begin the training phase of your schooling session. Ideally, your horse should be working forward from behind through his back and into an elastic contact. However, in practice, and depending on the level at which your horse is working, you may need to begin the training phase when you get an acceptable reaction to your basic aids. The training scale tells you how to challenge your horse, and it also reminds you when you’ve pushed him too far. For example, if the rhythm starts to suffer or there’s resistance to the contact, you know you are asking too much of the horse, and you should take a step back. 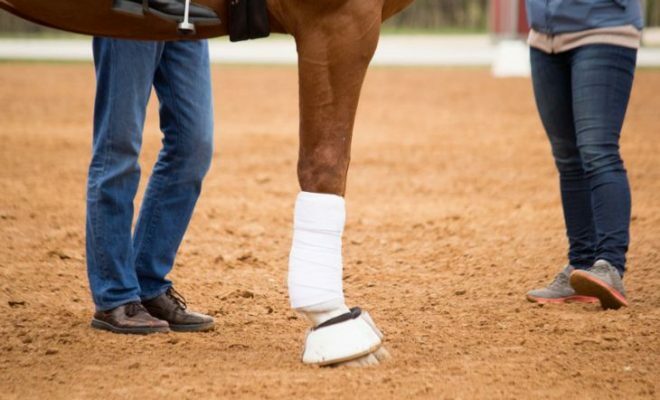 Find out what’s caused the problem: perhaps take a walk break, lighten your hand or seat, or try giving your horse a sympathetic pat, and then begin work again. The inclusion of frequent walk breaks in the training phase is a beneficial tactic. Firstly, the horse learns that walking doesn’t mean that work is over for the day! 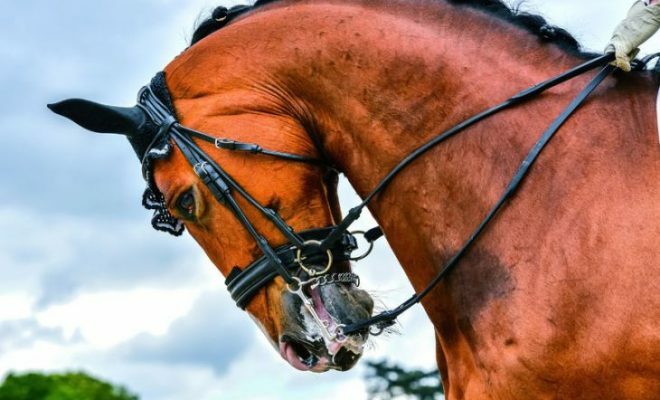 That’s important when it comes to riding a dressage test; you don’t want your horse to think he’s finished as soon as you get to the walk exercises! Walking also allows the horse to get his breath back between bouts of more strenuous work, gradually increases his stamina and strength, and allows tired muscles to recover. 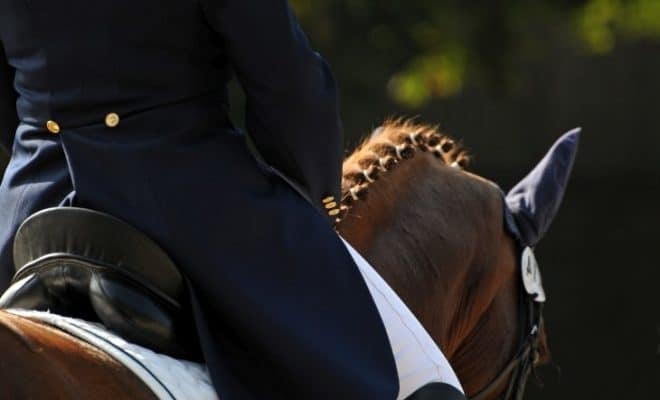 The dressage tests are all numbered sequentially, beginning with the simplest. In theory, the higher the number, the more challenging the work contained in the test will be. A useful exercise you can do from your armchair on a cold, wet day is to spend time looking through each test and making a note of the different movements it contains. You can then use your list as a basis for your training plan. So, once your horse can perform everything at Prelim and Novice level to a good standard, you know he’s ready to move on to Elementary, etc. 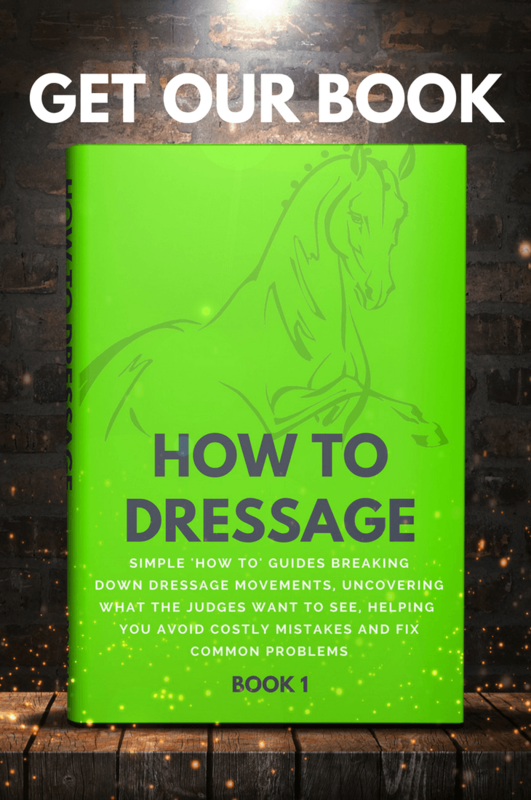 Using the dressage tests as a basis for your training plan also allows you to vary the exercises you use during the training phase so that the work doesn’t become repetitive and boring for your horse. All professional athletes include a cooldown phase, both in their training sessions and in competition. And your horse is no different! Cooling down helps to prevent injury and muscle stiffness, and it’s crucial to your horse’s wellbeing. When you’ve finished the training phase of your work-out, finish off each schooling session with a few simple exercises in rising trot that allow the horse to stretch his muscles and loosen his back, followed by a period of walking on a long rein. The cooling-off walk allows the horse’s heart to slow down, lets his circulation return to normal, and prevents the horse’s muscles from stiffening-up when he is at rest. A clear dressage training plan for your horse is essential if you are to progress up the levels. Begin your training sessions with a warm-up phase, then move on to a training phase where new exercises are introduced, or new work is consolidated. Finish each session with a cooldown phase to prevent injury and muscle stiffness. Do you have any top tips on how to create a dressage training plan for your horse? If you do, please share them with us in the comments box below.